Q: I am having issues uploading my receipt. A: Please note the following requirements for uploading receipts: image must be under 5MB and in the format of PNG, GIF, or JPG. If you have further difficulties uploading your receipt, please try to clear browser cache and cookies and upload again. If the problem persists, we recommend trying to upload on a different device. Q: Why was my receipt rejected? A: If you receive a rejection or failure email notice, there will be a brief description in the email stating what the problem may be. Here is more information about the "reason for rejection" shown in your email. Ambiguous Receipt — It is not clear that the product is eligible for this program. Some retailers may use product descriptions which are not recognized by our receipt scanning. Duplicate — This receipt is the same as another receipt that has been previously submitted. You might have submitted this same receipt before, or it could have been submitted by another customer. Illegible Receipt — The picture is too blurry or small or has some other problem that makes it difficult to read. Try taking a new photo or screenshot and submitting it again. Invalid Date — Receipts must be for purchases on or after June 1, 2018. This error may also happen if there is no date on the receipt. Invalid Receipt — The photo may be of the box, or your cat, or something that is not a receipt, like a packing list. Missing Product — The receipt doesn't show any eligible products. It may be from a restaurant or some other store. If you have a very long receipt, don't crop it into two images and submit the pieces individually. You can fold it so the product and date and time of purchase are showing, and submit just a single image. Q: How do I know if my receipt was validated? A: You will receive an email within 48 hours of uploading your receipt which will either confirm validation, or if you need to resubmit your receipt. Q: What should I do if my receipt is too long to photograph? A: If your receipt is too long to fit into one image, fold the receipt to show the participating products and the header with the store name, purchase date, etc., and then take a picture of the receipt and upload the image per the upload instructions. NOTE: a valid receipt must show the purchase of an ARM & HAMMER™ Cat Litter product, with the product circled (keeping the product clearly visible). One or more receipts can be uploaded showing your purchase of 2 or more ARM & HAMMER™ Cat Litter products at one time. Q: Can I scan a receipt that lists 2 or more packages of qualifying ARM & HAMMER™ Cat Litter? A: Yes you can. We will accumulate and count the number of units of qualified ARM & HAMMER™ Cat Litter you purchase. You are eligible to receive 1 charm for every 2 qualifying packages you purchase. Q: What if I only have one cash register receipt for a qualified ARM & HAMMER™ Cat Litter? A: You may hold it until you have the second qualifying receipt, and then upload them both at that time. Or, you can upload the receipts one at a time. Once you have uploaded that first receipt and have registered, we will keep a record of that purchase. Once you have purchased the second qualifying product and upload that receipt you will then be eligible to receive your charm. If a receipt does not qualify for some reason we will let you know that too. Q: How can I order multiple charms? A: You can only select one charm at a time. 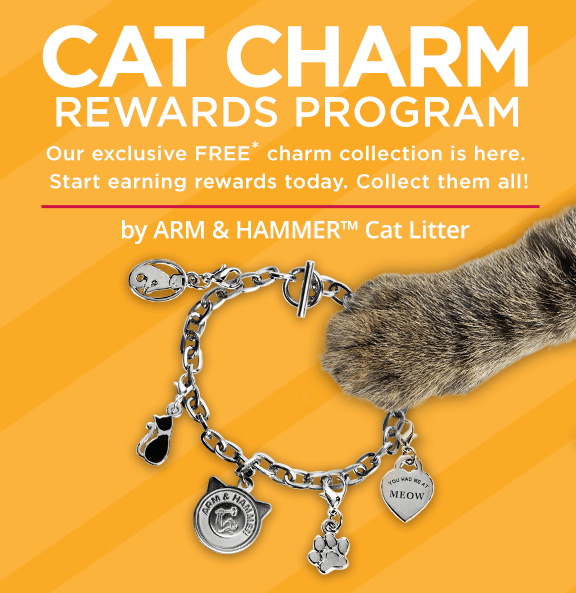 If you have one receipt (or multiple receipts) with more than 2 qualifying purchases of ARM & HAMMER™ cat litters, please select your first charm and upload receipt. When your receipt(s) is validated your first charm will be processed and you can log back into your account to select your next charm. Your account will be credited with your purchases, every two boxes of cat litter purchased will count towards one charm/bracelet. Q: Why do I have to set up an ARM & HAMMER™ Cat Litter Charm Rewards Program Order account? A: We do this so we can keep track of your Charm order and qualifying register receipts. There are currently 5 charms and 1 bracelet from which you may choose. By setting up your account, you will not have to retype any information when you want to redeem another charm, you can simply log in to your existing account. Q: Is my active email address really necessary to place an ARM & HAMMER™ Cat Litter Charm Order? A: Yes it is! It is our primary way of contacting you regarding the status of your orders. It is linked to your ARM & HAMMER™ Cat Charm Rewards account so it is very important to keep your email address up to date. Your phone number is optional but also an easy and effective way for us to contact you should any issue with your order arise, like a USPS return or other mail problem. Q: How do I know which ARM & HAMMER™ Cat Litter products are part of this charm offer? A: Any ARM & HAMMER™ or Feline Pine™ brand Cat Litter product will qualify. Q: Do I have to purchase 2 boxes of ARM & HAMMER™ Cat Litter at the same time? A: No, you may upload one or more receipts showing your purchases of ARM & HAMMER™ Cat Litter in different transactions. Q: Is the offer valid for purchases made online? A: Yes, the offer is valid for online purchases, you must upload a photo of your digital purchase receipt. Q: Can I mail in my order and receipts, instead of placing an order online? A: At this time, this charm offer is completed online and does not have any mail-in options. Q: Once I submit my order, how long will it take before I receive my charm? Once you have received notification that your receipt was validated, please allow 4 weeks to receive your charm in the mail. Q: How can I contact someone regarding my charm order? A: If you have questions or need more help with your order, including difficulty uploading photos or with receipt validation, we are available to help. If your account is under a different email address, please include it so we can easily find your order. Note: Email messages are monitored during weekday business hours only. We will respond to emails received over the weekend on the next business day.